Yes Christopher at Karve Shaving is making a small limited run Karve razors out of plastic. Made to order so it will take several weeks to ship this run will expire tonight at midnight. Christopher assures that this is not a joke. Heads will be in all sizes closed and open comb but the handle length will be limited to 3" or 3.25" long. no just checked the website so I will save you the trouble. 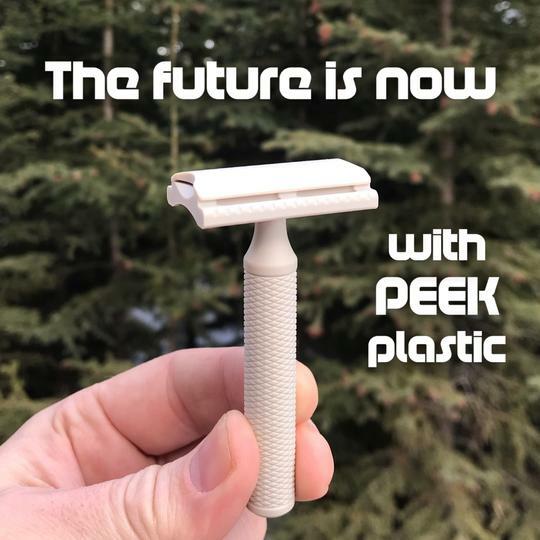 a novelty or a peek at the future? (04-01-2019, 04:47 AM)Sully Wrote: Is this an April fools joke? I had to Google PEAK PLASTIC. Pretty amazing stuff and pretty expensive stuff too. BUT, I'll stick with metal....It has a pretty good reputation..
(04-01-2019, 06:48 AM)zipper Wrote: I had to Google PEAK PLASTIC. Pretty amazing stuff and pretty expensive stuff too. BUT, I'll stick with metal....It has a pretty good reputation.. Always wise for a gentleman to follow the tried and true axioms, ie. Haven't checked the website yet but my first thought is if it's made from recycled plastics than that's a pretty cool thing. (04-02-2019, 10:49 AM)gRider Wrote: Haven't checked the website yet but my first thought is if it's made from recycled plastics than that's a pretty cool thing. umm high quality engineering plastic with a melting point of 360C. I dont think this material comes from post consumer waste.